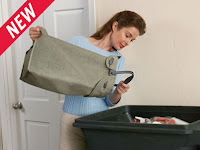 Do you feel like your garbage is full all the time, that you never have a good spot to collect your recyclables, or that your current recycling collection container is ugly and in your way all the time? 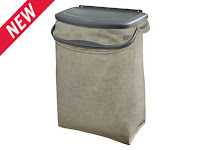 Then you might need the awesome new Hidden Recycler from Rubbermaid! There are a lot of awesome features to the Hidden Recycler! First of all, I love how easily it is concealed in any cupboard or cabinet! Ours fits perfectly under the sink for easy collection of all our recyclables! It doesn't stand out like a sore thumb in my kitchen or add any clutter to my already tiny kitchen! I also LOVE the material of this bag! It is easy to wash and it is easy to remove and empty! Plus, the material is made from recyclable material and is recyclable! If you need an easy to empty, hidden and convenient place to store your recyclables, make sure to check out the Hidden Recycler! Buy It: You can purchase the Hidden Recycler online at Rubbermaid.com and in store at Meijer. Win It: Rubbermaid is generously offering (1) Hidden Recycler to a lucky winner!